As I received the 8870/M25. I recently took delivery of an old 8870 and thought it worth while documenting its restoration and some techniques that may be helpful to others. First things first, do NOT be tempted to just plug it in, and hope for the best. It would be such a shame to damage anything just because you can’t wait to see if it works. Nixdorf equipment is quite robust and there’s every chance that if the last time it was switched off it was working, it may spring back to life again after a bit of love and care. If the computer and its peripherals have been stored in a none-heated location for any length of time, bring it into the warmth and leave them to warm up; it will make cleaning a lot simpler once all the condensation has gone and you don't want any electrical short circuits. I would suggest taking lots of pictures of how the machine looks before you start its restoration, not just so you’ve got a record of how bad it looked before you serviced it, but it’s very useful if some cable suddenly comes lose and you’ve no idea where it went. Once you’ve got all the pictures you need, carefully remove all the plates (boards) and peripherals. The plates are secured in the chassis by a single screw that is accessed via a hole in the centre of the backplane behind each plate. You'll need a long, narrow flat-blade screw driver. The screws have retainer clips fitted so won’t fall out. There is also a retaining screw behind the power supply unit but it’s not in an obvious position. Nixdorf had a special tool to assist with plate removal called a “Plate Key”, but you don’t need one. Grab the top and bottom edges of each plate with the tips of your fingers and wiggle the board up and down whilst pulling. AS SOON as it starts to move, reduce the pulling pressure else you WILL rip the skin off your knuckles on your lower hand. Once all the plates and peripherals are removed, each needs to be opened in turn and the dust and debris carefully brushed away. Each plate has two aluminium covers and there are two screws at the rear of each cover that need to be removed. Remove both covers off each plate and clean the PCB and the insides of the plates covers. A decorators paint brush and if available, a compressed air blower are ideal for this (you may want to do this outside !!!!!). I also gave all front mounted connectors on each plate (if there are any) and the rear edge-way connector a quick squirt of contact cleaner after removing any dust. Gold pins that can touch the metal cover. Depending on the type, the CPU is usually made of up to three plates and this can be opened in a concertina fashion by loosening the screws along the top edge of each plate. On some CPU’s, on the underside of one of the boards you will see rows of gold pins. I’ve noticed that on some CPU’s these gold pins come dangerously close to the shorting out to the aluminium protection cover. In these boards, I’ve just slipped a piece of stiff card under the cover before re-fixing it to act as an insulator. The same procedure should be applied to the peripheral devices; Floppy Disk, SMC drives, Hard disk drives etc. Open up the enclosures and remove dust and debris. Tape heads should be cleaned with head cleaner and check and clean any rubber drive wheels. Check for any fluff collecting under or around micro-switches. Also inspect for corrosion around any contacts or broken / lose wires. Many boards have plug in piggy-back boards. Carefully remove these and inspect the connection pins for signs of corrosion. A squirt of switch cleaner before remounting the piggy-back board will help. 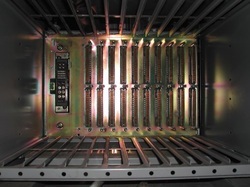 When cleaning the PSU, inspect it very carefully for anything suspicious; browning of components or PCB, signs of smoke, or blown fuses, components that are cracked or bulging or anything lose. Experience seems to be that if a major component is going to fail, it’s probably going to be the PSU. Servicing the battery backup plate - 3038. Inside the battery backup plate. The 3038 battery backup plate needs special attention as it contains a NiCad battery pack that’s almost certainly leaked and this may have caused damage. Mine had leaked a little, but corrosion had sprung up in some very unlikely places. The wires from the battery pack to the main PCB are soldered and the connections had corroded. The battery backup plate also has an external non-locking toggle switch that acts as the CPU reset switch. Somehow, both the connections to this switch were corroded and the switch was very difficult to move, even after a generous squirt of switch cleaner. This switch was replaced as were both the short linking fly wires as the copper in the wire had corroded and wouldn’t solder any more. The actual battery pack is a bit of a problem. 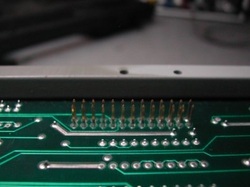 You may just be better cutting the two wires close to the PCB and then removing the pack. There are two Torx screws near the edge and a hidden Philips screw that comes through the metal plate frame securing the pack. If you want, you can replace the cells within the pack; it requires 15 x C cells (that’s 18v). For now, I cleaned up the pack, “zapped” it on my bench power supply a few times (that’s a technical term meaning that I forced a very high voltage into the pack several times over a few minutes; no more than a couple of seconds per burst) to try and reactive the pack. It sort of worked but I’ll come to this later. ​I wrote a separate article on servicing this plate. Next turn your attention to the chassis. There are fans located over each tier in the 8870; five or six (seems to depend on chassis initial configuration) on a M25 machine. These need to be removed and cleaned. Computers don’t like heat and it’s imperative that the fans are all working. Any fan failures will generate a fan failure message and illuminate the FAN LED on the CPU control panel. Removing the 4-pin molex connecter for each fan in turn will allow you to identify the failed fan; the fan fail indication will cease when you disconnect the failed unit. All the fans should be kept in running order; don't be tempted to just disconnect and forget about a failed unit. 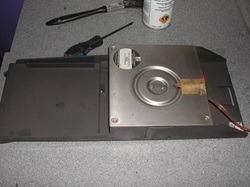 From the rear of the machine, disconnect the 4 pin Molex connector cable for the fan, then force the fan tray forward (I used a large screw driver on the plastic to force each one forward), and then slip another screw driver between the fan and the chassis; this will release the clip. You can now slide the fan tray out backwards. The fans are identical (well, there are several different models but they are all compatible with each other) so you don’t need to worry which fan came from where. Next, clean the fan modules. The fans with the metal blades are the worst for collecting muck and dirt. The metal fan assembly is fixed to the plastic mounting tray with four Torx screws. Remove the screws and the fan assembly should lift off from its enclosure. At this point I just threw the plastic fan enclosure into a sink full of warm soapy water. The fan motor unit needs to be serviced and all the muck scraped out from each blade using a screw driver and a brush. It’s a dirty job !! The dirt removed from a single fan module. On top of the fan motor are two flat blade screws that carefully need to be removed and a piece of sticky tape that’s used to hold the motor wires in place. CARFULL… under that metal cover is a piece of ferrite looking material that protects the top of the fan shaft; don’t lose it. Using a brush, carefully remove all the dust making sure to brush from the centre of the fan outwards and avoiding the fine copper wires. Once complete I removed the ferrite cover and gave a quick squirt of aerosol grease. Reassemble the fan and then mount it back into it’s now clean and dry plastic tray. 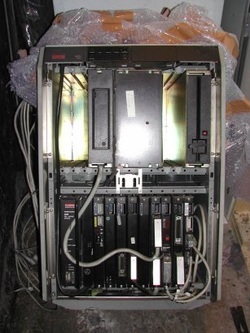 Clean the backplane and chassis. Once the fans are out of the way you need to remove all the dust and debris from the chassis. Vacuum every nook and cranny you can find and carefully dust off the edge connectors. I also used a damp cloth to wipe over any cables that I found as well. All the fan trays can now be remounted back in the machine. A quick squirt of contact cleaner on the plugs just before they are reconnected is a good idea. So, at this stage were just about ready for the first test. Inspect the system mains power lead for damage and replace if necessary. Also check that there’s a real fuse in the mains plug (you wouldn’t believe some of the things I’ve found in place of a fuse). Insert the PSU back in its slot giving it a good firm push. The PSU can ONLY be inserted in the slot on the left as it has a special connector. Make sure the switch on the front of the PSU is in the Off position. For some computers, it’s advisable to use a Variac that allows you to control the mains voltage to the PSU and allows you to bring the PSU up slowly as opposed to the voltage surge that the PSU gets when you just throw the switch. Unfortunately, the PSU’s Nixdorf used are SMPS (Switched Mode Power Supplies) and will only work within a certain range of voltages. You will unfortunately have to “throw the switch” and hope. 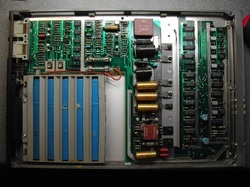 After the PSU, insert the 3038 battery plate in the first slot to the right of the PSU. Without the 3038 battery backup plate installed (and it doesn't matter if the actual battery pack is present or not), the PSU will pulse and on and off and behave very erratically. On the back of the machine located on the metal base plate below where the PSU sits, there is a mains rocker switch, this should be glowing red (though it’s possible the neon has blown). Either way, make sure the switch is ON. With the PSU switch in the OFF position, plug in the mains lead. On the PSU, move the switch to Peripheral, almost at once, some of the PSU lights should come on, and the fans should start running. The fans are 24v and get their power from the PSU; running fans is a fair indication that the PSU is working. The NEN red LED on the battery plate should be lit and if the battery pack is in place, the BATT red LED should also be on. At this point, the PSU knows there is a problem as it needs to CPU to tell it to keep powered up. If you move the PSU switch to Normal, the PSU will automatically shut down, however, leave the system running for a while and carefully watch and listen for strange noises from the PSU, smoke or heaven forbid, bangs or flashes. If after 30 mins or so everything seems stable, it’s time to reassemble the system. If you do hear a bang or a crack but everything keeps running, it may just be the X mains filter capacitors in the PSU. These are just used for high-frequency filtering and whilst they need to be replaced, they won't be critical to the continued functioning of the PSU. The smell from them is... distinctive. If all looks good switch off by moving the PSU switch to Off. The second system I refurbished behaved slightly differently in that the system wouldn't stay powered up with just the PSU and 3038 plate installed. It would very quickly pulse the power then switch off for a few seconds, then try again. I ended up inserting the CPU (plate number begins 15??) and that did the trick. Now it’s time to re-install all the boards and peripherals. For now, we will limit the system to the bare essentials as this reduces the load on the PSU as much as possible. Leaving the battery plate where it is, next insert the CPU module (the 1517 or 1559 CPUs are three plates linked together), then the disk controller (2515, 2549 etc) and finally an ALME (1882). Each ALME has an 8-way dip switch at the top. You need to make sure you only insert the 1st ALME if you have several. Look on the inside of the front door; it will tell you the DIP switch settings for the first ALME so use that ALME. Do NOT change the ALME dip settings at this point. Locate and use the correct ALME. That’s about the smallest configuration you can get away with. Don’t forget to connect the cable for the disk to the controller; I bet you’re pleased you took those photographs showing where all the cables went now aren't you. Om the M25, the disc drive cable connects to the lower socket, SMC drive when installed connects to the upper one. There is a black cable that comes down from the chassis lid that needs to be plugged into one of the CPU 25 way female connectors; make sure it’s in the correct one; the one on the right hand side. When you’re ready, move the switch to the Service position and the machine should start up. As soon as it starts, move it back to Normal. If the system shuts down immediately, there’s a problem some place. For a start, make sure all the plates are pushed in as far as they will go and there are no empty slots between plates. Assuming the system keeps running, watch the CPU status display on the top of the chassis. If it shows “44” from the beginning, you’ve got it in the wrong connector on the CPU module - guess how I know that. It should flash some different status codes, then count 1, 2 and 3 and then settle at 26 (VDU does not reply). If you get this far, the CPU, disk and disk controller are working. Look at the red LED on the bottom channel of the ALME, it should be flashing. This also means that there is an operating system on the disk as the CPU has managed to load the DAP loader routines and is waiting for a VDU. Before this point, you should really have serviced the VDU and should know which is the master port #0 !! You can now connect a master port VDU to the computer. If you’ve got several terminals you need to locate the right one; and unless somebody has marked port #0 for you, it’s going to be trial and error. Channel 0 on the ALME (the bottom connector with the flashing LED) is usually fitted with a V24 card with remote switch on. This means that you can start the computer just by switching on the master port (port #0). You can’t switch the computer off from here, only on. Usually, ALME #0, channel #0 is reserved for the master port, channel #1 is for a modem, and all other channels are usually fitted with IHSS cards for terminals or just empty. When you find and connect the correct terminal, you should be up and running. Check here for details of VDU cables required. Keep an eye on the system. Watch for smoke or strange smells or noises. Sometimes the fans start to resonate with the chassis but this is nothing to worry about. At the first sign of trouble switch off immediately from the mains. These machines when they were new and fully serviced, used to run for many hours at a time, often for weeks or months without ever being powered down. With good ventilation and all the fans running, 24x7 operation really wasn't a problem for them. However, your machine is probably around 30 years old. Do NOT leave it running unattended. My first 8870 started throwing think smoke from the battery back-up module after around 40 hrs of run-time. Also, DO NOT leave the machine plugged in even if the PSU switch is in the OFF or NORMAL position. The PSU draws a small amount of power whenever the mains is connected event if the machine isn't running, and it's a fire hazard in a machine of this age. This also applies to the VDUs. They have a soft power-on switch which allows the VDU to be started from a low-voltage switch on the keyboard. This means that the PSU is always active so again, switch ALL VDUs off from the mains when not in use. Assuming you get your system up and running, and manage to log in, I would suggest that the first thing you do is perform a system backup.